Here is a special opportunity for you, a dear friend of Dragonfly Healing Center, to be in beautiful community and spend time on the gorgeous land at Jikoji Retreat and Zen Center! Zen is inextricably interwoven with nature; we learn through practice that we are a part of nature, not separate from the open space which surrounds Jikoji. We will explore elements of the natural world through our senses. Please bring a vegetarian food item, snack, or healthy beverage to share. There is a full kitchen, however only plan to heat food as needed instead of cooking onsite. We will gather in the Community Area at 5pm for time to socialize and mix and mingle. Join with like-minded people who are on journeys of self-care, personal development, and awareness plus who love nature, connecting with others, eating good food, laughing and enjoying life! Welcome and Introductions will start at 5:30pm. We will do some Qi gong and mindful movement to prepare us for the starlight hike. This event is open to all genders! Especially join us if you are a woman interested in connecting with other ladies from the Moving Into the Light Women's Retreat. You will be able to register for the retreat at this event for $100 instead of $150. 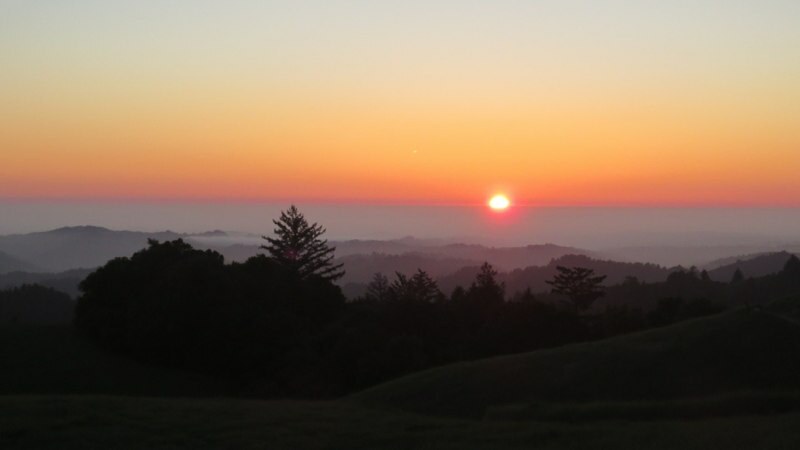 There are only 4 spots left in the retreat to be held October 17-19th, 2014 in Pescadero, California near the coast. About the Starlight Hike - We will be joining a group already at Jikoji to participate in the evening hike. Peter Szydlowski will lead the starlight hike, as he did during most of his years as a Pinnacles National Park interpreter. Also facilitating are Charles Ewing, a naturalist for almost two decades at Pinnacles National Park, and Ingrid Mednis who was a caretaker at Jikoji for many years and now is an interpreter at Henry Cowell State Park. The starlight hike will be in silence. We will meditate together at the top of the ridge with the mountains and the sea stretched in front of us and the stars glistening above us. Logistics: Bring water bottles, comfortable hiking shoes, layered clothing, and a small flashlight with a red light or red material to cover the lens. Overcast may cancel the starlight hike, or at least obscure the stars. *Most cell phones do not work here. Yay!!! Space is limited! Please RSVP early to ensure inclusion. Minimum Suggested Donation is $10.